This church has been very artistically, if not profusely, decorated, and a considerable quantity of colour introduced amongst the green has relieved the sombre effect which inevitably accompanies a decoration of evergreens only. On the communion table are some fine bunches of white lilies, Christmas roses and Eucharist lilies, and on each side are a number of hot-house plants. Along the front choir-rail a pleasing effect is produced with evergreens, heathers, tulips, hyacinths, and other white flowers. On the front of the pulpit is a cross formed of green, with white everlasting daisies, and the reading lectern is decked with grasses and holly. The front is ornamented with some handsome grasses, holly and berries, and bunches of evergreens are placed in the window niches. The decorations in this church though not very extensive, are carried out with taste and judgement. The pulpit is trimmed with variegated holly and evergreens, as is also the communion table, on which stands hothouse plants. Along the front of the choir is a string of ivy creepers, and the gas brackets, window ledges, and pillars, are decked with evergreens. Merry Christmas everyone – Elizabeth. Last week I began transcribing the baptisms that have taken place at St John the Baptist church from the very first one until some unspecified time (until I go mad and blind from microfiche reader overuse, probably). It’s going to take me a long time. 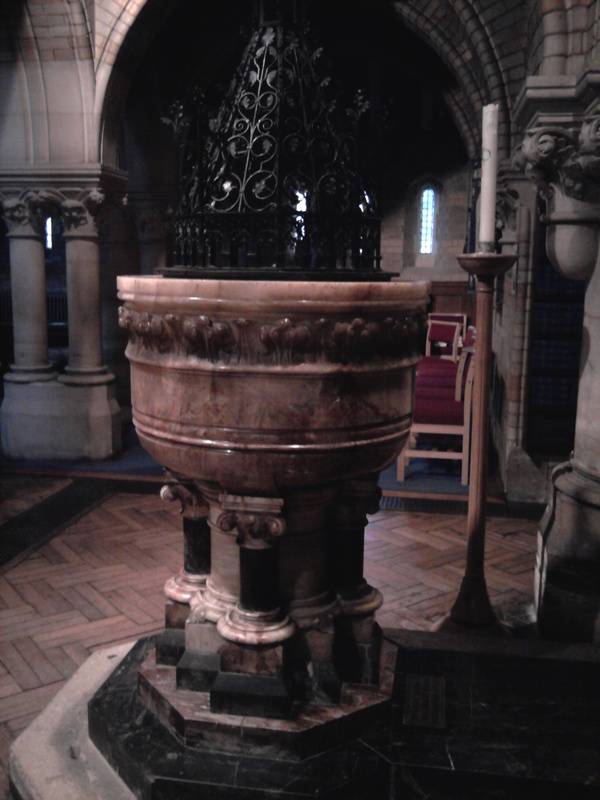 In its first year of active service (geddit, service…) the font – designed and donated by the architect who designed the church – was used in 30 baptisms. Soon after there were well over 50 christenings a year, as Clarendon Park built up and more and more people moved in. I have only managed the first five years so far (over 270 baptisms) but it has been interesting to look at the database. One thing that has particularly fascinated me is the way that neighbours seemed to get their children baptised all at the same time. So no one in Montague Road, for instance, would be christened for several months…and then all of a sudden three or four families would appear within a week or so. This happened so many times that it can’t be a coincidence. I did wonder whether the curate was doing his rounds and telling off the residents for not having their children baptised quickly enough! 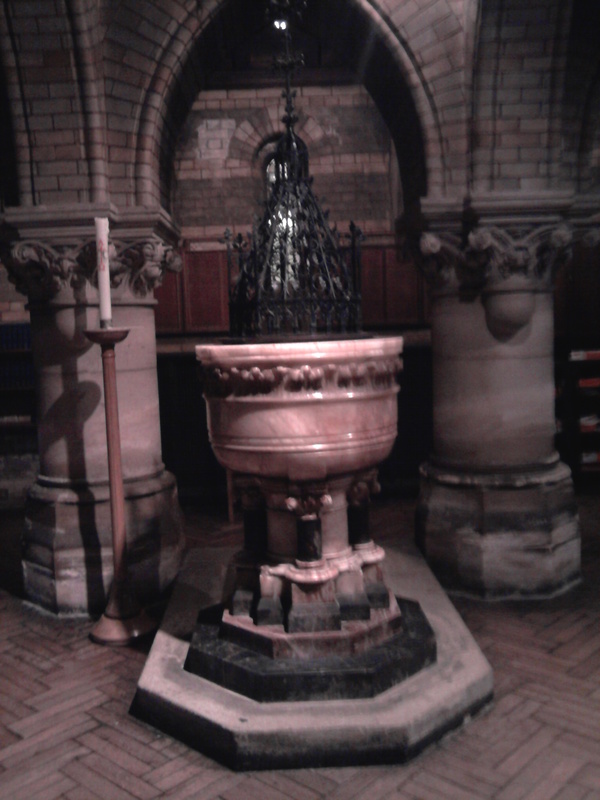 There are many occasions where entire families were baptised together, adults included. It was certainly common for all the children to be baptised on one day – from teenagers to new babies. On 6th July 1885 Ellen (10), John William (5), Annie (3) and Ethel Elizabeth (1) Stapleford, of Queens Road, were baptised together. I wonder whether it was the excitement of being amongst the first to be baptised at the new church that encouraged so many? The very first baptisms took place on 5th October 1885. The children were William Harper, Beatrice Onion and Alice Muddimer, all of Avenue Road Extension and all just two or three months old. One of these days I plan to write a little biography of each – if indeed any of them survived to adulthood. Sadly I recognise many, many names in my baptisms database who went on the appear shortly afterwards in my database of the burials at St Mary Magdalene, Knighton. Such was the reality of childhood in Victorian times. Both my boys were baptised in the same beautiful font and I am so grateful that their life chances are better in every sense. If you would like me to look up a baptism in my database then please let me know. I have only reached 1890 so far but I will keep your request on record until I get there. I am also happy to look up Clarendon Park burials at St Mary Magdalene – my database is complete from 1887 – 1951. Regards, Elizabeth. 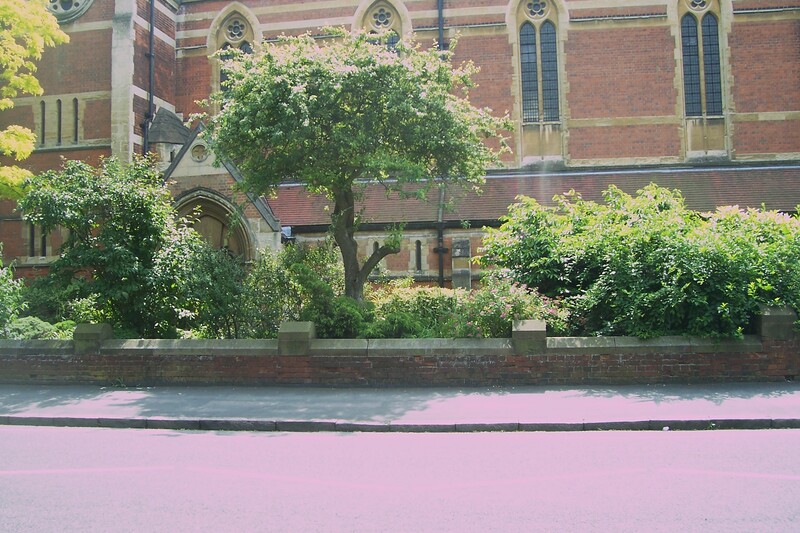 St John the Baptist Church, on Clarendon Park Road, is the parish church of Clarendon Park. It is an Anglican Church (Church of England). There is far too much to say about its history in just one post, but I would like to share with you a few pictures and facts about its earliest days. St John’s was built in 1884-1885 by architects Goddard and Paget of Leicester, funded largely by a gift of £6,000 from Miss Sarah Barlow (more about her some other time). It was built as a chapel of ease in the parish of St Mary Magdalene, Knighton, and only became parish church in its own right in 1917. 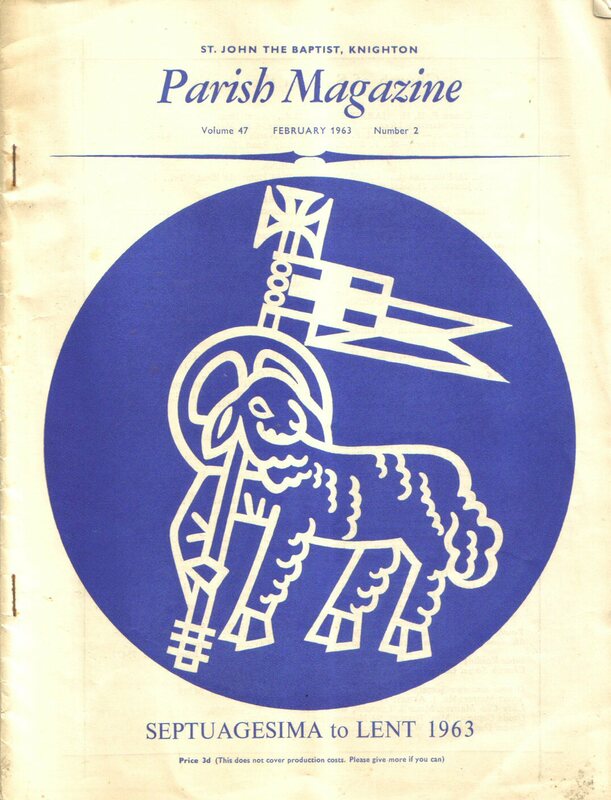 The parish minute books show how pleased the then vicar and churchwardens were, as it considerably simplified the financial running of the churches. Joseph Goddard also built Leicester’s clock tower, in 1868. Here is an excellent site about the Goddard empire. St John’s was designed in the Victorian gothic style. I think it is fair to say that it is considerably more imposing on the inside than the outside. The level of detail is astonishing and the overall impression is of grandeur and awe. 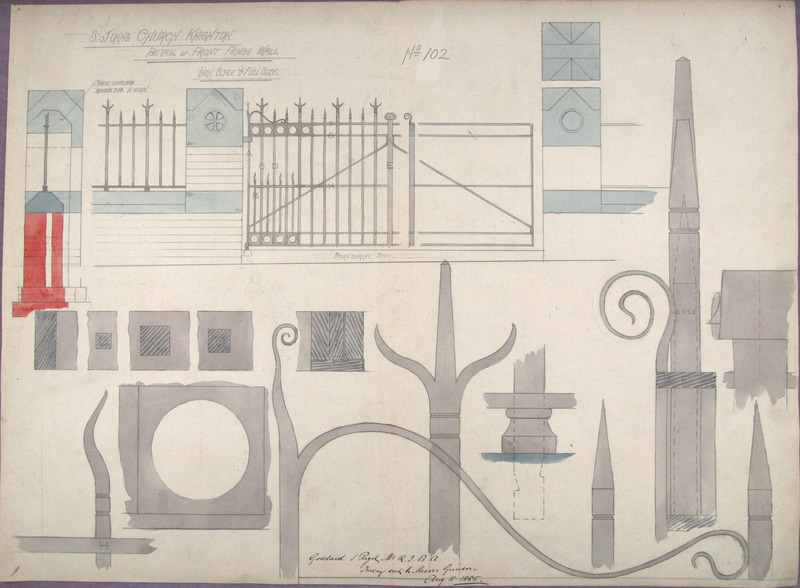 Here is one of Goddard’s original designs for the railings that used to top the front boundary wall (which you can see in the photo above have been removed…probably as part of the war effort). Luckily the attractive gate still stands. Leicestershire Records Office holds all the original designs, and they are beautiful in themselves. As for the interior, here is a postcard showing the interior as it was before the addition of a new reredos in memory of Guy Edward Frank Russell, who died in World War I. 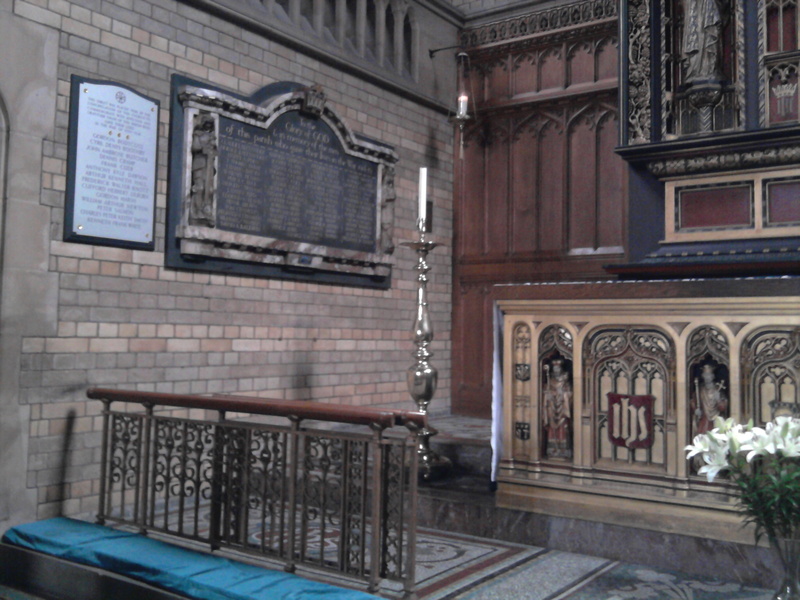 The screen is still in place – this was taken down within living memory of the current congregation. St John’s is open 9 – 3pm most days except weekends (services on Sunday are at 8.30am, 9.30am and 11am) and it is well worth a visit even if you are not a practising Christian. There is a lot more to say about St John’s but some other time! 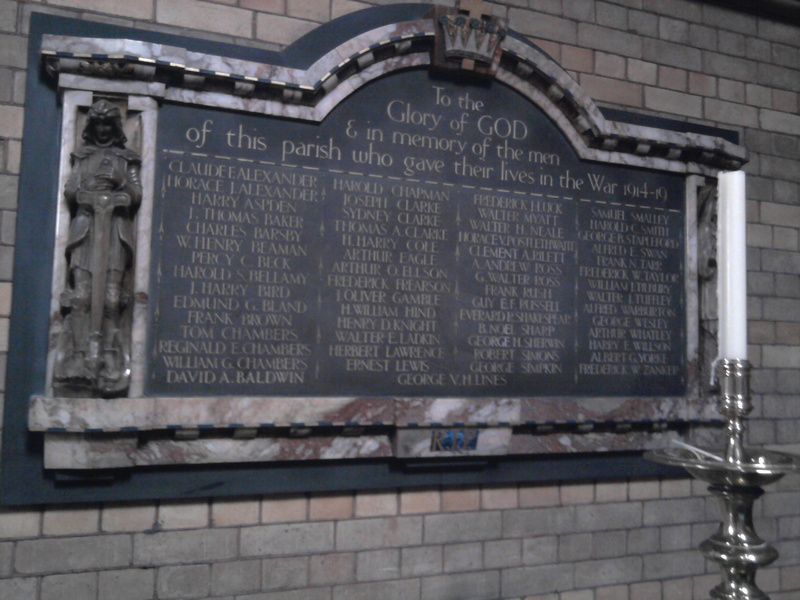 In the meantime, check the Index page of this site for several more articles about St John’s. Regards, Elizabeth.